Do you want to know Abubakar Shekau? He is the face of terror. A ruthless leader with a twisted ideology. And the sadistic architect of a campaign of mayhem and misery. And yet, very little is known about Shekau, the leader of the dreaded Boko Haram terrorist group. He operates in the shadows, leaving his underlings to orchestrate his repulsive mandates. He resurfaces every once in a while in videotaped messages to mock the impotence of the Nigerian military. And he uses his faith to recruit the impressionable and the disenfranchised to his cause. He’s elusive. Even his age is unknown — estimates range between 38 and 49. The U.S. State Department has Shekau’s year of birth listed as 1965, 1969 and 1975. He’s a loner. Analysts describe Shekau as a loner and a master of disguise. He does not speak directly with members, opting to communicate through a few select confidants. Attended Borno State College of Legal and Islamic Studies for higher studies on Islam. That’s why he’s also known as ‘Darul Tawheed,’ which translates to an expert in monotheism, or the oneness of Allah. He speaks several languages fluently: Hausa, Fulani, Kanuri and Arabic. But English isn’t one of them. After all, he heads a group that rejects all things Western. He uses many aliases: Abu Bakr Skikwa, Imam Abu Bakr Shiku and Abu Muhammad Abu Bakr Bin Muhammad Al Shakwi Al Muslimi Bishku among them. He was an unruly No. 2. Boko Haram was founded by Mohammed Yusuf, a charismatic, well-educated cleric who drove a Mercedes as part of his push for a pure Islamic state in Nigeria. He wasn’t too effective as a leader and had a hard time keeping his second-in-command in check. Shekau was more radical and had grander designs. And merciless as No. 1. Mohammed Yusuf was killed in a security crackdown in 2009, along with about 700 of his followers. That left Shekau in charge. He vowed to strike back, and his group has spared no one: government workers, police officers, journalists, villagers, students and churchgoers. Human Rights Watch estimates that in the past five years, more than 3,000 people have been killed. He’s come back from the dead. The military has touted Shekau’s death several times, only to retract its claim after he appeared alive and vibrant in propaganda videos. They almost got him in September 2012 when they raided his home, where he had snuck in for his six-day-old baby’s naming ceremony, according to the International Crisis Group. He managed to get away with a gunshot wound to the leg; his wife and three children were taken by the military. He uses Islam to recruit and radicalise. The northeast, where Boko Haram has been most active, is economically depressed and among the least educated regions in Nigeria. There’s no firm evidence as yet that Boko Haram has ambitions beyond Nigeria. But its campaign of terror has spilled into remote parts of Cameroon and it appears to have informal links with militant Islamist groups in Mali and Niger. 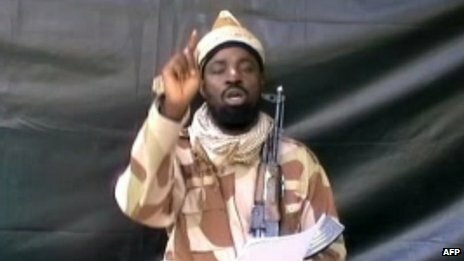 It was in May 2013 that Shekau first announced in a video that Boko Haram would start kidnapping girls. The kidnappings, he said, were retaliation for Nigerian security forces nabbing the wives and children of group members. The most horrifying instance was last month’s abduction of 276 girls from a girl’s school. There’s a $7 million bounty on his head. Shekau has been on the radar of U.S. officials since he came to power in 2009. Last June, the United States put a bounty on him, offering a reward of up to $7 million for information leading to his location. But that’s yet to yield results.